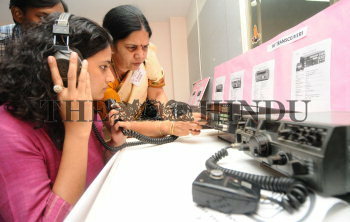 Caption : HYDERABAD:18/04/2010:-Bharathi Prasad Chief Coordinator of National Institute of Amateur Radio helps youngsters to communicate via HF transceivers at one of the kind Amateur Radio Museum whch is inaugurated on the occasion of World Amateur Radio Day at NIAR in Hyderabad on Sunday. The museum houses an impressive display of a wide range of HF/VHF/UHF Amateur (HAM) Radio wireless communication equipment from the roots of inventions, experiments ranging from the 1950s to the latest equipment of the day. Several homebrewed devices and accessories including HF transceivers, antennas, baluns, direction finding devices used for hunting hidden transmitter in the game of ?Fox Hunt? etc. are also on display. Photo: Mohammed_Yousuf.